Jack’s has replacement Lawn Mower Belts for Commercial Bobcat mowers or tractors. 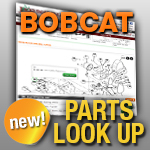 So, if you have a problem with your Bobcat Mower Belt, Jack’s is the place to come first to find the right replacement part. When you have a problem with your Lawn Tractor Belt, you can count on Jack’s! Select either an OEM spec belt, or belt by size.